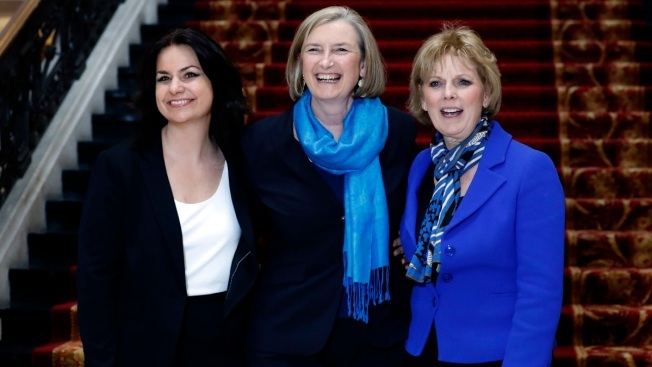 British politicians Heidi Allen, left, Sarah Wollaston, center, and Anna Soubry, right, joined new political party 'The Independent Group' pose for a photograph after a press conference in Westminster in London, Wednesday, Feb. 20, 2019. Cracks in Britain's political party system yawned wider Wednesday, as three pro-European lawmakers - Soubry, Allen and Wollaston - quit the governing Conservatives to join a newly formed centrist group of independents who are opposed to the government's plan for Britain's departure from the European Union. 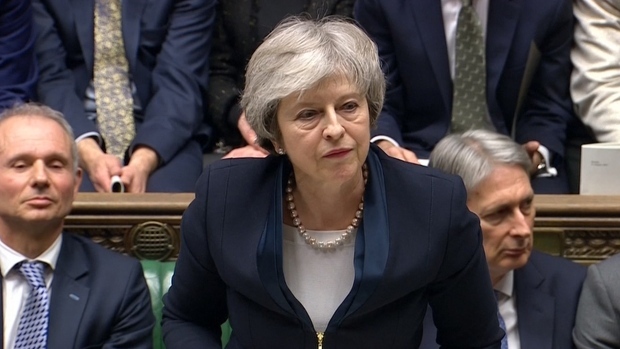 After the resignations of three of her party's lawmakers over Brexit, British Prime Minister Theresa May came away from more talks on preventing the U.K. from crashing out of the European Union with both she and the EU's chief deeming their meeting "constructive" Wednesday. But a joint communique from the two promised their respective negotiating teams "would continue to explore the options in a positive spirit." "We've made progress," said May. May has been trying to persuade the EU to revise the draft agreement on Britain's withdrawal because lawmakers in Parliament have refused to approve it. But the EU has steadfastly refused to reopen the 585-page legal text. The statement from Juncker and May said they discussed possible "alternative arrangements" and changes to an accompanying political declaration as potential options. The joint statement said negotiators from the two sides "will review progress again in the coming days, seized of the tight timescale and the historic significance of setting the EU and the U.K. on a path to a deep and unique future partnership." "I don't want you to think Mrs. May is responsible for this injury on my face," Juncker said before welcoming the prime minister to Brussels during a stilted ceremony that did not include a kiss or a handshake like previous occasions. 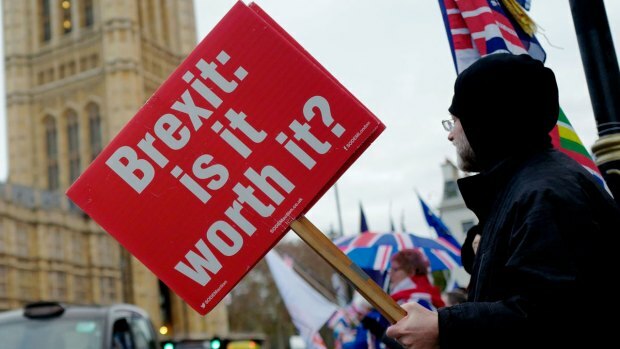 The stalemate over the divorce deal has raised fears of Britain leaving without an agreement on its departure or future relations with the EU, a scenario that could present severe economic disruptions for both sides. It has also raised the possibility of May's government seeking to delay its exit to wrap up negotiations. "Time is of the essence, and it's in both our interests that when the U.K. leaves the EU, it does so in an orderly way," said May. The difficulties finding a proper way out of the crisis over Brexit has created Britain's biggest parliamentary crisis in decades. Brexit-driven political cracks yawned wider Wednesday as three pro-European lawmakers quit May's ruling Conservatives to join a new centrist group of independents who oppose May's determination to take Britain out of the EU with or without a divorce deal. Anna Soubry, Heidi Allen and Sarah Wollaston resigned to join eight ex-opposition Labour Party lawmakers in an alliance dubbed the Independent Group. The defections mark the biggest shake-up in decades for Britain's political parties. U.K. lawmakers object to a border provision between the U.K.'s Northern Ireland and EU member Ireland that would keep the U.K. in a customs union with the EU until a permanent new trading relationship is in place. May wants to change the deal's phrasing to make sure that the mechanism to ensure an open Irish border after Brexit would only apply temporarily.